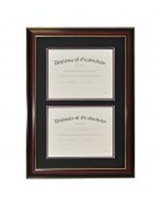 Looking for diploma frames to put up your hard earned diploma up on the wall then look no further than Gradshop's line of USA made graduation diploma frames. We specialize in producing diploma frames for high schools, colleges and universities around the country. 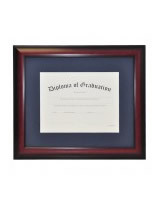 Our diploma frames feature high quality matting, as well as top of the line moulding and mounting construction. Take a look at the numerous customizable options we available. Preserve and show off your achievements with handcrafted USA made frames from Gradshop.